This is a beautiful cosmic family portrait of what is known as the “Sagittarius Sunflower.” What you are looking at are 3 distinct cosmic nebulae. On the left we have the famous M8 or “Lagoon Nebula,” located about 4,400 light years from Earth. This nebula alone is about hundreds of light years across or about 1 quadrillion KM. To try and put that in perspective, if we travelled at 50 km/s (which we have before) it would take us 5 trillion hours or 26 million years!! And this is in our own Milky Way. We haven’t even left our neighborhood! On the bottom we have M20 or the “Trifid Nebula,” located 5,200 light years from Earth. Finally on the right we have NGC 6559 located 5,000 light years away. 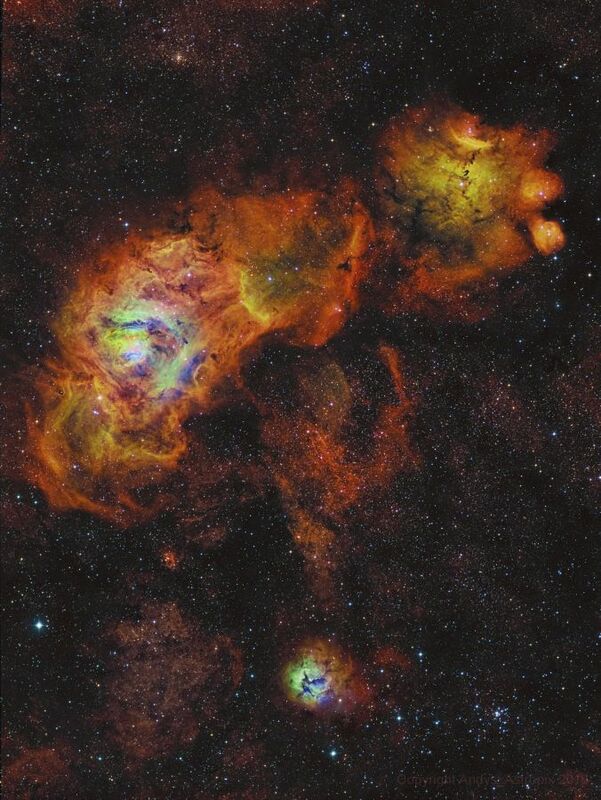 This narrowband data records ionized hydrogen, oxygen, and sulfur atoms radiating at visible wavelengths.